During the BlizzCon 2018 World of Warcraft What’s Next panel, Ion Hazzikostas announced the release date for Battle for Azeroth‘s next big update: December 11, just about five weeks away. The patch will include the Battle of Dazar’alor raid, with a different progression and story for each faction, as well as the Darkshore Warfront, new Azerite armor, new and improved Island Expeditions, and new open-world Assaults content, similar to the Legion Invasions in 7.2. Other system improvements will provide account-wide transmog unlocks from reputation vendors and account-wide counting for total Exalted reputations. The patch will also add a dubloon vendor for purchasable Island Expedition rewards, along with updates to classes and the Warmode system. 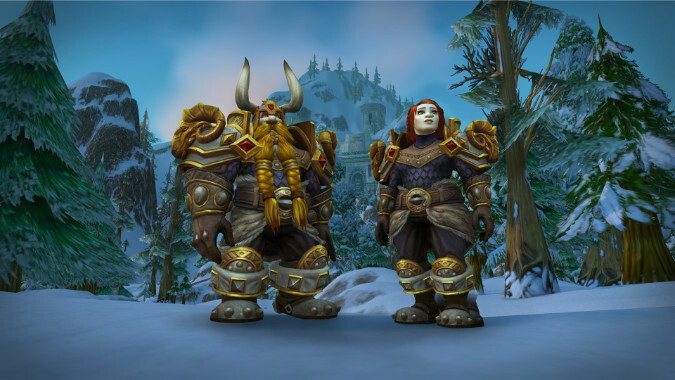 Heritage armor for Blood Elves and Dwarves will also be included. The December 11 date puts the patch release at 119 days after Battle for Azeroth launched, which is a longer development cycle than Legion‘s content patches. Given all the issues surrounding Battle for Azeroth‘s systems, however, I think we’d all prefer that Blizzard takes their time. Unfortunately, the Zandalari and Kul’Tiran Allied races won’t be released until the next patch, 8.1.5.